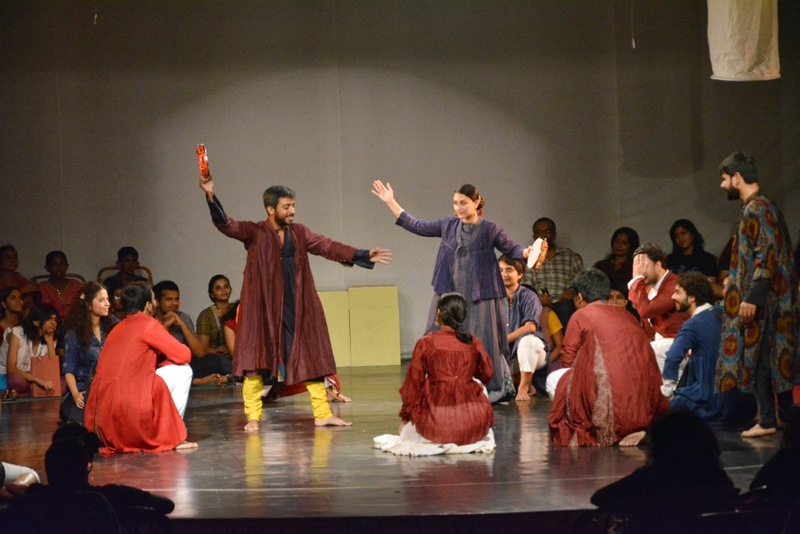 Ranvir Shah’s Prakriti Foundation presented the sixth edition of Hamara Shakespeare festival this year at Kalakshetra. The Bhand Pather artists were very clear about their decision to have three sons for Badshah Pather (Shakespeare’s King Lear), when they heard the story from the director M. K. Raina. Shakespeare’s tragedy has three daughters to the King. The first two praise him sky high and tell him in elaborate words how much they love him. The youngest says she has no words to describe her love for him. Angered, the King disowns her and divides all his wealth between the first two daughters. His power is completely cut off by the two daughters who turn him out. The youngest rescues him and has to die in the act. His lament after he realises his folly is one of the most poignant scenes in Shakespearean tragedies around the world. 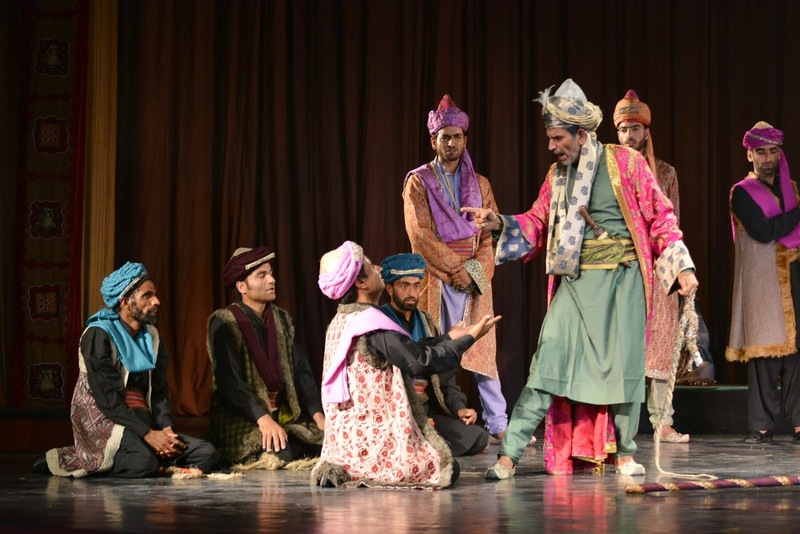 But here in Badshah Pather (King Lear) performed by a Kashmiri group of traditional artists, there were three sons to the King. “Daughters would never abandon their fathers,” they told Raina, “sons would...”. Presented at Kalakshetra, the play was so clear and straightforward that lack of understanding of the Kashmiri dialect they spoke did not bother me at all. The centuries old native form called ‘Bhand Pather’, a form of farcical theatre, is full of dance and song and clowning. It is said to have entered Kashmir from Persia through the Muslim courts in the 14th century and then spread through the rest of north India. “Travelling all the way from Kashmir with their theatre that had been silent for a long time during the strife days to Chennai, to Kalakshetra, is a pilgrimage,” said MK Raina. “To present it in their own language is a special honour.” My mind travelled back to another time when King Lear was presented in Kannada by the Ninasam group from Heggodu. 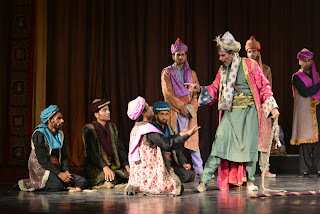 King Lear in Kashmiri was performed on the second day. On the first day was an extremely confident “A Winter’s Tale” in English and Hindi in promenade theatre, where the audience moves with the play to different locations for different scenes. 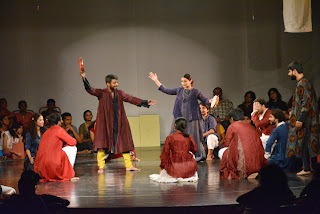 The play began on the Rukmini Arangam stage at Kalakshetra, where the audience was invited to sit all around the play area. This first section in which Leontes, the King of Sicily, convinces himself in a fit of wild and unfounded jealousy, that his pregnant wife is carrying his best friend’s love child and plots to kill his friend, was played in English. I have never heard such Shakespearean dialogue delivered in such an easy and supremely confident manner. The tragedy of the jealousy was peppered with song and dance and great acting. Then the audience was asked to turn to the back of the auditorium where the little baby girl of the queen was abandoned and found to be raised elsewhere. This was played in Hindi. The audience was next asked to move to the banyan tree, where Bohemia was shown in festivity and the little girl had grown up and fallen in love with the prince. Every dialogue was applauded loudly by the Kalakshetra students who have perhaps never seen the banyan tree used for such flamboyant costumes, romancing and bawdy comedy. I had to leave at this stage as I had promised an elderly couple a ride back home and they said they had lost focus in the move to the new location. 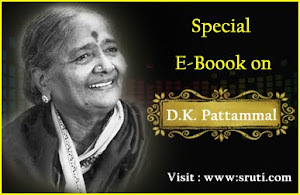 I later heard generous praise for the last section at Padma Pushkarini for one of the most theatrically exciting endings. Neel Chaudhuri and Anirudh Nair gave a performance with vivid costumes, original music, songs, dance, and acrobatics and an extremely enjoyable play. 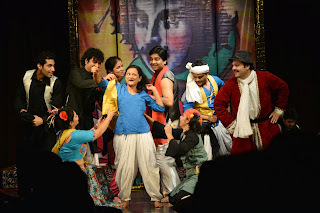 On the final day Twelfth Night was performed in Hindi as Pia Behurupia by the company directed by Atul Kumar. It brought the roof down with its relentless humour. In the household of Olivia, two campaigns are being quietly waged - one by the lovesick Duke Orsino against the heart of the indifferent Olivia; the other by an alliance of servants and hangers-on against the high-handedness of her steward, the pompous Malvolio. When Orsino engages the cross-dressed Viola to plead with Olivia on his behalf, a bittersweet chain of events follows. Twelfth Night combines cruelty with high comedy and the pangs of unrequited love with some of the subtlest poetry and most exquisite songs Shakespeare ever wrote. 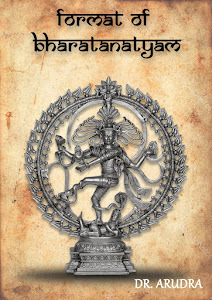 Piya Behrupiya, a Hindi translation by Amitosh Nagpal, has a “strong Indian folk leaning” even though it is a translation and not an adaptation. It was a riotous comedy with different accents. Sir Andrew had a Bengali accent while the heroine Olivia was pure Punjabi. Each member of the cast sang very well, while dancing away in glory. The audience was rolling with laughter even for songs sung seriously. A qawwali was a superb inclusion. An unforgettable experience. It took a while to come out of the spell of these three plays. Prakriti Foundation brought some superb plays in the earlier Hamara Shakespeare festivals. There was a brilliant Jangal Mey Mangal in the Tamasha style in Marathi, a hilarious Romeo and Juliet in Malayalam and an unbelievably beautiful Macbeth in solo Koodiyattam by Margi Madhu. The one thing the audience must understand is to come and feel the language. Every one knows the stories of the plays Shakespeare wrote and it is not difficult to read up a summary on the Internet. 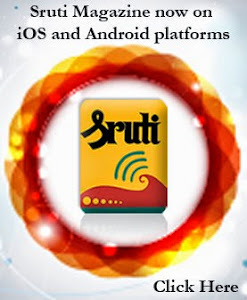 It is the feel of the different language that lends this festival its very special USP. That there was a very good audience this time was a tribute to the dogged perseverance of Ranvir Shah.